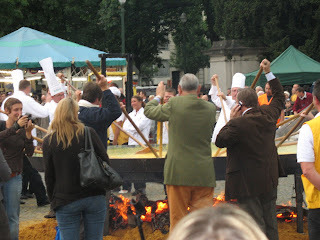 I've done my best to inform everyone I've spoken with in the past week, but just in case I've missed you, here it is: I witnessed a giant omelette being cooked in the middle of a bustling avenue here in Brussels. If this is the sort of thing that interest you, click your way to my Giant omelette set on Flickr for full coverage of this event. I've been rather slack at posting lately. I use the term lately loosely here. I suppose one of the reasons for this is that my life has been rather hectic over the past few weeks and I couldn't be bothered to explain it (now is a good time for you to question why I have a blog in the first place). Not so much the actual day-to-day aspect of my life (which has in fact been very enjoyable, days spent cycling and walking and reading). I mean hectic in terms of my upcoming plans. In case it needs to be clarified, I finished my internship in France at the end of last month, and am ever grateful to Edd's parents who scooped me out of Commercy and brought me back here, to Brussels. Just before my time ended in France, I was offered a fantastic internship with ICLEI - Local Governments for Sustainability at their European headquarters in Freiburg, Germany. In short, ICLEI's work focuses on training local governments from all over the world to develop initiatives to promote sustainability within their jurisdiction. As this is where my passion in Environmental issues truly lies, I could not be happier. ... my fears, along with those of 17 million voters in France, have been realised. Say hello to the new president of the French republic.